Use up that leftover turkey and make a hearty gluten-free dairy free soup that everyone can join the days after Thanksgiving. I don’t know about you, but I make extra turkey just so we can have a wide variety of turkey leftovers. We love turkey in our home and eat it just about every which way. 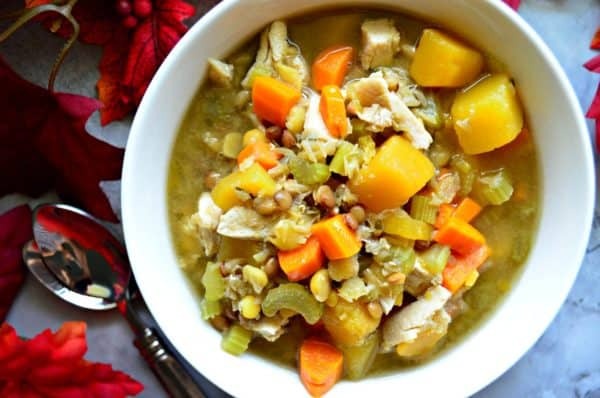 I’ve made a wide-variety of turkey soups in the past but I’ve never made a turkey soup with lentils. I’ve recently become a little obsessed with lentils, and that’s how the idea of this soup came about. I used a precut butternut squash and diced carrots, celery and onions which I then sweated out for a few minutes in a large 6-quart soup pot with a little of the chicken broth. If you can find turkey broth then use that—I find it’s only stocked during the holiday season and is limited quantities. Chicken broth works just fine though. Once the vegetables become soft (about 10 minutes) then I add in the lentils. I like to use the autumn blend of lentils. They are a mix of red, orange, and green lentils. If you can’t find a mix of lentils you can use whatever color suits your fancy. I add in the seasons into the pot and the low sodium chicken stock. I do this to lessen our salt in take and of course control the flavors. Regular chicken stock can sometimes be too salty for my pallet. You’ll want to add the cooked diced turkey last because you don’t want to dry out the turkey. Remember, it’s already cooked! 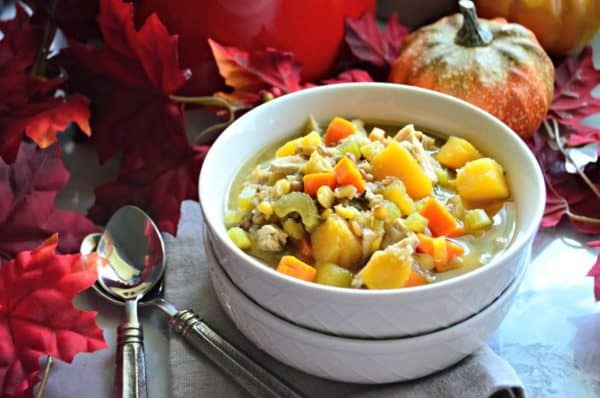 You just simply want to reheat the turkey and marry the flavors of the soup in with the meat. Once the soup is ready it’s time to ladle the soup into bowls and enjoy. You can serve this with some leftover dinner rolls or maple bacon skillet cornbread you made for your holiday dinner. I like to serve this with a salad too and most of the times we eat some form of turkey soup for lunch the next day after our big meal. So a soup (like this recipe), a salad, and rolls makes the perfect day after lunch for my family. 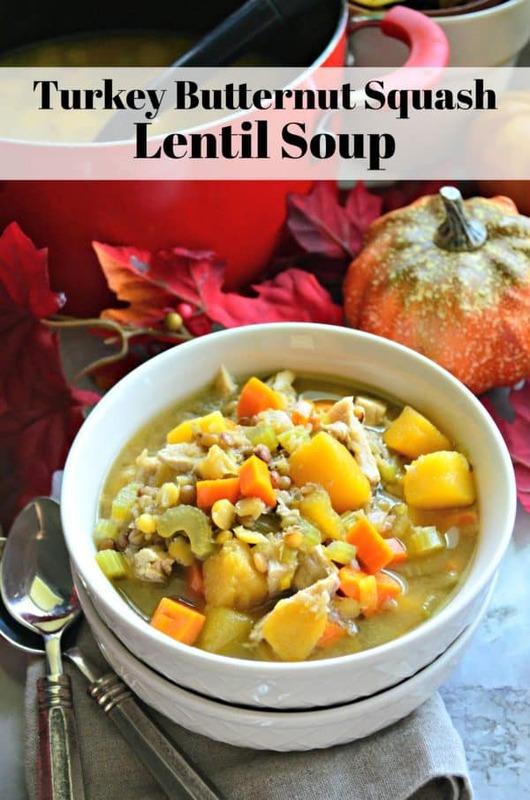 If your looking for an alternative to the traditional turkey soup recipe I invite you to make this Turkey Butternut Squash and Lentil Soup with some of your leftover turkey this year!